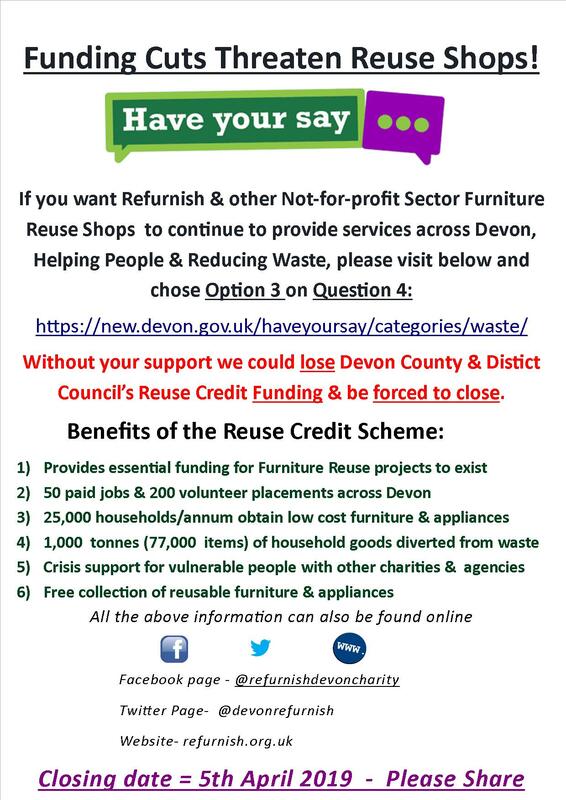 We are very pleased to announce that Refurnish Devon won the FRN Slogan competition! For more information head over to the news section on the right hand side & check out our winning entry. Refurnish has an eBay page! The charity has recently taken on three new shops based in North Devon widening their catchment area across Devon to Barnstaple, Bideford & South Molton. 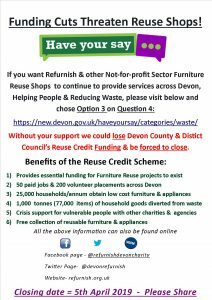 Merging with the charity formerly known as SMR Phoenix, David Banks, Chief Executive of Refurnish Devon, has worked closely with David Winter the charities new operations manager to save the shops from closure. SMR Phoenix have provided similar services to the residents of North Devon since 1986. By joining with Refurnish, it not only allows the shops to continue to deliver these facilities, but by adopting many of the successful practices Refurnish have established already, they hope to continue to grow & build on the strengths of both charities by uniting together under one umbrella.